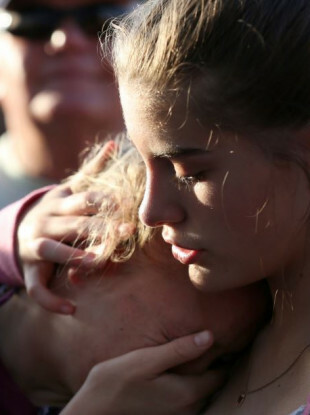 Abigail Adams, right, comforts her friend Hannah Hershey during a vigil for the victims of the Santa Fe High School shooting on Friday. THE 10 PEOPLE, mostly students, who were shot dead by a teenager at Santa Fe High School in Texas on Friday, have been named. Dimitrios Pagourtzis, 17, has been charged with capital murder. A further 13 people were wounded in the attack. More information has emerged about the victims of the mass shooting, to whom tributes have been paid. Black had just turned 17 and his birthday party was due to take place yesterday. He enjoyed playing video games, anime and wrestling. He was in his favorite class, art, when he was shot dead. She later announced Fisher’s death and thanked well-wishers. Garcia enjoyed water skiing and riding jet skis. His death was confirmed by a cousin. Mary Baker, reportedly Kyle’s great-aunt, posted on Friday that he was killed in the shooting. Various social media accounts said that he died in his favorite class, art. A substitute teacher, she was known to many as Grandma Perkins. A friend called her a “beloved teacher, family friend and woman”. She reportedly looked forward to retiring. A GoFundMe page raising money for her funeral said that she “protected her students in her last moments”. “Angelique’s smile was contagious and brightened up any room she walked into,” a family friend wrote on a GoFundMe page set up to assist her relatives. In losing Angelique, her friends and family lost so much. She was described as “a kind, compassionate and caring individual”. A Pakistani exchange student, Sheikh had been due to return to Karachi in the coming weeks in time for Eid al-Fitr, marking the end of the holy Muslim month of Ramadan. “I kept calling her and sent her messages on WhatsApp. Never before had my daughter failed to reply,” her father Abdul Aziz told AFP, fighting back tears at his home in the southern port city Karachi, just hours after he and his wife had their worst fears confirmed. “We are still in a state of denial. It is like a nightmare,” Aziz said. “Being a brother was his best job,” Stone’s sister Mercedez told CNN. Although he was the youngest, he definitely protected his sisters as if he was the oldest. He was always there if someone needed someone to listen or some cheering up. Stone, a junior at the school, was “adventurous” and “willing to try anything” such as parasailing and jet skiing, Mercedez said. A friend described him on Twitter as a “sweet and funny boy”. Tisdale, a substitute teacher and longtime paralegal worker, was leading an art class when she was shot dead. Her adult son Recie Tisdale, a police detective, told the Washington Post that his mother “started substitute teaching because she loved to help children”, not because she needed the money. A GoFundMe page to help Vaughan’s mother described the high school student as a longtime Girl Scout who was “loved by many”. The teen’s mother, Rhonda Hart, is a member of the US Army. Vaughan is also survived by her brother Tyler. Email “'She should be getting her first car, not a funeral': Tributes paid to Santa Fe shooting victims”. Feedback on “'She should be getting her first car, not a funeral': Tributes paid to Santa Fe shooting victims”.